If you want to experience utter luxury, combined with the tradition and baronial turreted architecture of a grand Scottish country mansion, then set off to Biggar, South Lanarkshire, in South West Scotland. 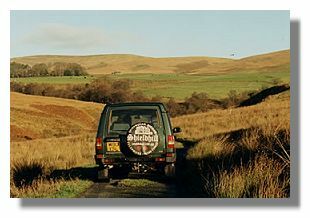 From Biggar, take the B7016 road to Carnwath and after a certain amount of good navigation, a few sharp bends and turns, in two or three miles you`ll reach Shieldhill Castle. Travel writer Vivien Devlin and her partner reached the castle without difficulty and here is what they found. Dating from the 12th century, in delightfully pretty parkland, this was the family seat of the Chancellor family for over 700 years. While renovation and extensions have altered the Castle over the centuries, there are still many original features, such as engraved family crests and shields, chimney-pieces, the Old Keep and the spiral staircase linking the hall to the library, formerly the chapel, and dating from 1199. The property is now privately owned by Bob and Christina Lamb who personally manage the hotel, creating a friendly, homely atmosphere, with a gastronomic feast awaiting you in their award winning Chancellors Restaurant. You will no doubt be warmly welcomed, as we were, by the two family dogs, Gunner, the tall and elegant black and white collie and Archie, the tiny terrier-of-sorts, with his quizzical, cheeky expression, one ear up and one down. They raced ahead playing tail-tag, leading us from the reception hall through to the comfortable oak-panelled drawing room, with a log fire blazing. Arriving in the late afternoon, traditional tea was served here complete with home made scones, clotted cream and jam, as well as a light lemon madeira cake. Well, it is more than four hours until dinner! Bedrooms and honeymoon suites are so luxurious that you may not wish to leave your room. Named after famous Scottish battles they are all completely individual: Culloden on the second floor under the eaves, has sloping ceilings, and a large period bathroom with antique clawfoot bath. 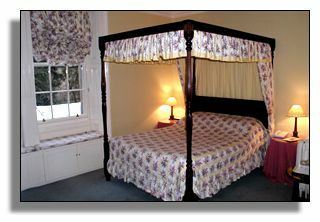 Glencoe is a bright, spacious room, with four poster bed, located in the "Old Keep" with window seats for a view over lawns and woodland. Scone has a beautifully draped king-sized four poster bed, oriental furnishings, and an enormous double jacuzzi in the bedroom itself. A long bubbling hot soak was utterly relaxing, with the perfect, decadent touch, a champagne ice bucket is at hand, for the ultimate romantic weekend. There is 24 hour room service if you wish complete seclusion and privacy. 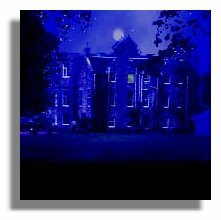 The castle is said to be haunted by the ghost of of a daughter of one of the Chancellor lords who is said to have wept herself to death. And nearby is the site of a fort where William Wallace addressed his men before a battle at Biggar. Weddings are very welcome, with ceremony, reception and bar facilities in an attractive permanent marquee linked directly to the Castle. The Chancellor honeymoon suite is quite lovely, decorated in soft blues, with a split level design, wide open views over the gardens from a large bay window, and of course, a double jacuzzi. If you do venture outside the surrounding area is perfect for lovely country walks. For something a little more energetic there is the challenge of climbing the 2, 333 foot Tinto Hill - what about a `jog` up there before breakfast?. There are also exhilerating ballooning expeditions arranged by the hotel and view the spectacular scenery of vales, rivers and woods from the air. Shieldhill Castle also manage their own Partridge and Pheasant Shoot at Mennock Valley, about half an hour away in the heart of the Dumfries and Galloway moorland. To reach the estate, you will travel through Wanlochhead, the highest village in Scotland, and on through the Mennock Pass. 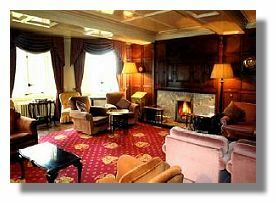 Average room rate is £150 per night and bookings can be made via the Shieldhill Castle Web site. Chancellors Restaurant offers an extensive and imaginative four course menu, specialising in fish and, of course, game from the Mennock Valley: breast of pheasant with smoked bacon and truffle oil, and partridge with puy lentils and tagliatelle. Also on the menu, lamb, salmon and Aberdeen Angus steaks - a house speciality and a selection of vegetarian dishes. I selected soft, spicy Thai vegetable cakes to start while my partner enjoyed a smoked haddock Welsh rarebit, with tomato salad and pesto dressing. Starters were served with home made sundried tomato and olive bread - light and delicious. We both missed out the second course - a selection of home made soups. Then a fillet of gilterhead bream, balanced on top of a mountain of smooth potato puree, with scallops scattered around the side, for me, and ravioli of goats cheese ratatouille with sweet peppers, for him. The wine list is extremely impressive but perhaps slightly daunting to the uninitiated. Christina Lamb, who personally selects the wine, assisted our choice and suggested a rich, blackcurrant, velvety South African red; Christine, Buitenverwachting, 1996. From a wide dessert menu we selected a dark chocolate tart, and a platter of excellent cheese, served with grapes, apple and celery. The description for each dish shows great innovation in the kitchen, under the young chef Ashley Gallant. Chancellors has 2 AA rosettes and last November came second in the prestigious Scottish Tourist Board Flavour of Scotland Thistle Awards. 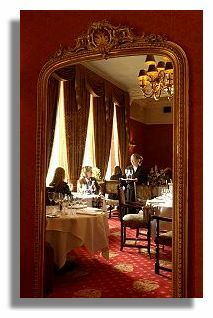 "A castle of dignified charm, flaming logs in baronial, wood-panelled rooms, the whole place exuding loving care and polish, all in the midst of soothingly tranquil Scottish scenery ... made more memorable by Ashley Gallant`s outstanding accomplished dishes ... and perceptively chosen, exceptional wines." For more information on Shieldhill Castle and to make a reservation, see the Shieldhill Castle Web site.